The folks at Molo have done it again. The makers of the wondrous 'Softwall' now bring you 'Softseating'. 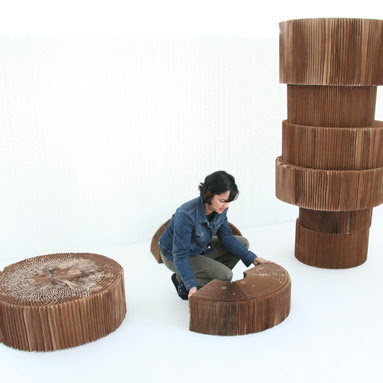 Made entirely from kraft paper, these compressible pieces can be used as stools, benches and (my favorite) loungers. Although the paper will soften over time, the seats are designed to last, thanks to their sturdy honeycomb structure. Available in natural, unbleached kraft paper or black (dyed with bamboo charcoal ink). Great post! Don't you love Molo? They make the most amazing stuff! They live here in my neck of the woods... and they are so very talented. I can't wait to see what they come up with next.. all their designs are so eco-cool and incredibly innovative!